Restless Chipotle » Brownie Ice Cream Recipe: Rich Chocolate Flavor! 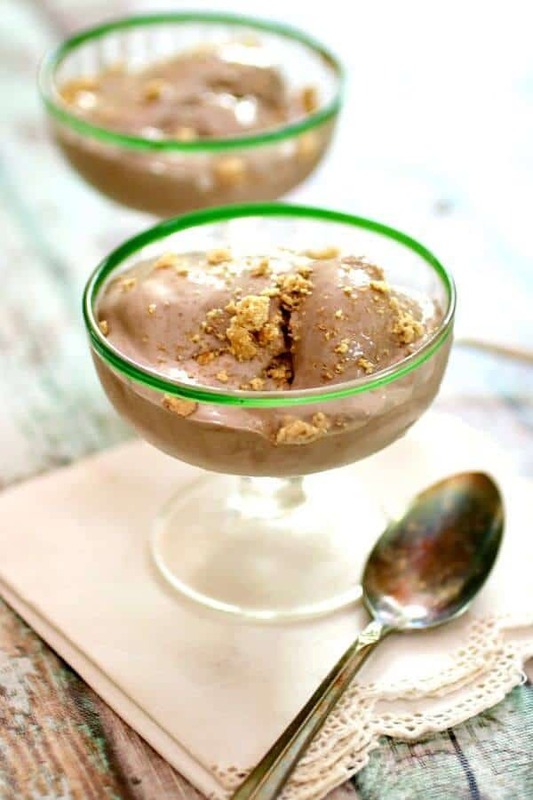 Brownie Ice Cream Recipe: Rich Chocolate Flavor! This brownie ice cream recipe makes an ultra premium chocolate ice cream that beats just about any that I’ve tasted. Brownie batter flavored ice cream has a swirl of real brownie batter and chunks of brownies and pecans. This is the stuff chocolate dreams are made of! This recipe doesn’t use eggs. I love homemade ice cream! When I was growing up we ate a lot of ice cream, especially chocolate ice cream, but it wasn’t ever homemade. My mom said she’d spent enough time hand cranking their old ice cream maker when she was growing up so she preferred going to the store and buying it! Still, as a kid I read lots and lots (only child AND introvert) of books – and between Anne of Green Gables, Little House on the Prairie, and Betsy Tacey and Tib I learned to love the idea of homemade ice cream. As I grew up I associated it with warm family memories that I didn’t want my kids to miss out on. Fast forward to today – half of my kids still prefer store bought. Go figure. I’ve had a lot of fun making all kinds of homemade ice cream over the years but I really love this particular chocolate ice cream recipe. I made it for my son’s 18th birthday and it was a big hit. I really hope you try it! Homemade brownie batter ice cream is easy to make – even for beginners! Because this brownie ice cream doesn’t require cooking before freezing it’s a great recipe for beginning cooks and novice ice cream makers to start with. Homemade ice cream usually begins with a custard that is cooked and cooled. This fudge brownie ice cream recipe leaves out the eggs so there’s no reason to cook it. It’s even easier! Heat cream, half and half, and sugar over medium low heat until bubbles form around the edge. Add the egg yolks and cook until the mixture thickens. Add flavorings and transfer to your ice cream maker. Turn on the machine and churn according to manufacturer’s instructions. About 5 minutes before the ice cream is finished, when it is thick, add ingredients like nuts, chocolate chips, or fruit. Ice cream is usually ready in about 20 minutes. In the case of this chocolate ice cream – which doesn’t require the cooking – you just toss everything into the ice cream maker and go! HOW TO YOU MAKE 5 MINUTE ICE CREAM IN A BAG? Don’t have an ice cream maker? This may work for you! Mix all ingredients called for in your recipe (leave out the eggs – this may not work for custard based ice creams). Pour into a quart sized bag and seal. Fill a gallon sized bag 3/4 full of ice, then add 1/3 cup salt to the ice. Place the smaller bag inside the larger bag and seal the larger bag. Shake vigorously for 5 minutes. This fudge brownie ice cream recipe leaves out the eggs so there’s no need to cook it. 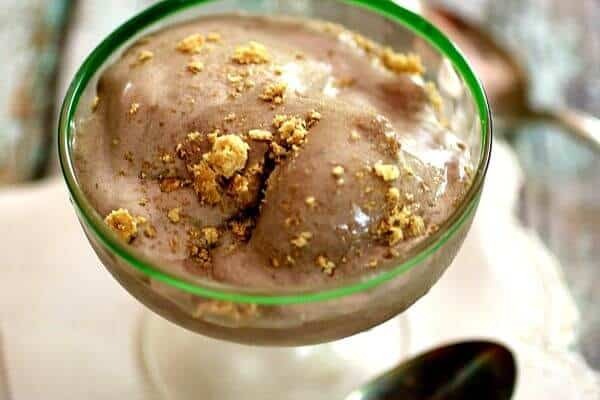 There are several recipes that don’t require it but if you love ice cream and you want to make it regularly an ice cream maker generally makes a higher quality, better ice cream. I have a Breville that I absolutely love! I am so spoiled by it that I will never ever use anything else. It has it’s own compressor so you don’t have to freeze the bowl or add salt + ice – it does all of the freezing automatically — you just need to set it to the right consistency. Hello chocolate ice cream every single day! 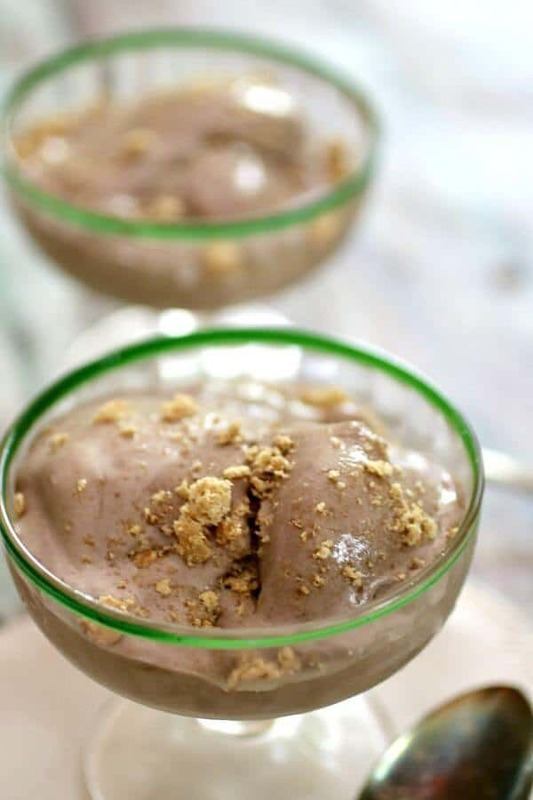 Cinnamon Gelato – this is SO creamy and rich! Just enough cinnamon to make it perfect with a slice of warm apple pie. Key Lime Hatch Chile Gelato – ok, you may think I am nuts but this tangy, spicy ice cream is my favorite. Homemade Mango Ice Cream – this one doesn’t require an ice cream maker, y’all! Chocolate Chocolate Chip Ice Cream – so good! If you love chocolate as much as I do this is your go to! 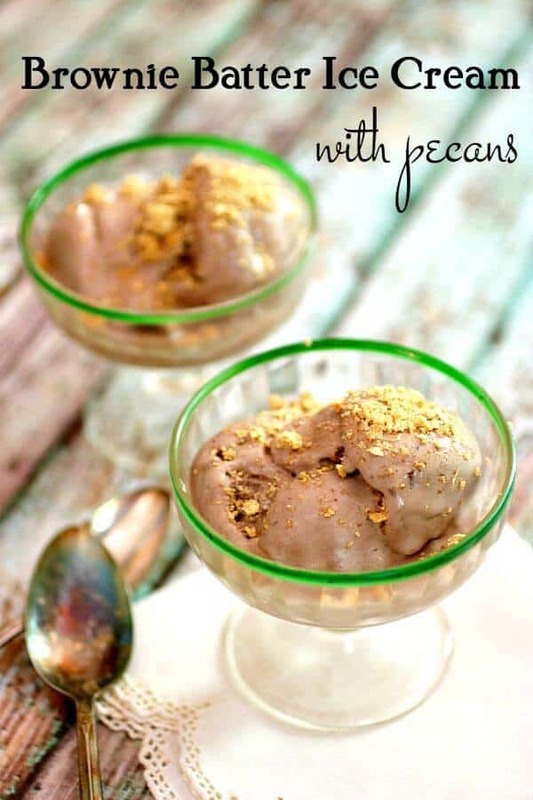 Peanut Butter Ice Cream – sweet and salty! This one is for the peanut butter lovers in your life. Homemade French Vanilla – this is a classic with SO much vanilla flavor that it’s not a bit boring. It’s also a great base ice cream recipe for adding chopped fruit. Lemon Ice Cream – tangy and lemony, this is not a sherbet but a true, creamy, luscious ice cream!! Dark Chocolate Mint Oreo Chunk – the darkest dark chocolate ice cream with bites of mint Oreos throughout. Coconut Ice Cream – uses goats milk. I came up with this one when I was raising dairy goats. There are instructions for using cow’s milk as well. This one is unique AND amazing! Brownie batter flavored ice cream has a swirl of real brownie batter and chunks of brownies and pecans. My husband loves Blue Bell Brownie Ice Cream so when we couldn’t find it at the store anymore I came up with this brownie ice cream version that maybe I like a little better. And by maybe I mean definitely… Homemade ice cream does melt a little more quickly than commercial ice cream so keep that in mind when serving (or taking pictures! )… I like it best with this red velvet hot fudge on top! Rich, creamy homemade chocolate ice cream that tastes like your favorite brownie batter! Quick and easy! It's SO good. Mix the 1/2 cup brownie mix and the sweetened condensed milk to make a thick batter and set aside. As the remaining ingredients, except pecans, to an ice cream maker and freeze according to manufacturer's directions. About 5 minutes before the ice cream is done add the brownie -sweetened condensed milk mixture and the pecans to the ice cream in a slow swirl so it swirls through the ice cream. Sometimes it just mixes in but it's ok - it's still delicious! Pack in a freezer container and freeze for 3 to 4 hours or overnight.